At first glance, the office water cooler looks innocuous, especially if you forego the dumpster-bound plastic cup and refill your (Philadelphia Phillies, 2008 World Champions) glass instead. However, there’s one key wasteful component unaccounted for: energy consumption. Yup, those heavy jugs need to be manufactured and then carted around town by big trucks—and they aren’t running on hydrogen. That’s where a bottleless water filtration system, which taps into your existing water line, comes in. The water is purified on the spot, and you might be surprised to learn that tap water quality is regulated, unlike bottled water. For over 22 years, our neighbors in Mount Laurel, NJ Arctic Coolers (www.arcticcoolers.com) have offered this service. Oh, and it seems to save money, too. My dad tells stories about going down to the corner store when he was a kid and buying black olives or pickles from a barrel. 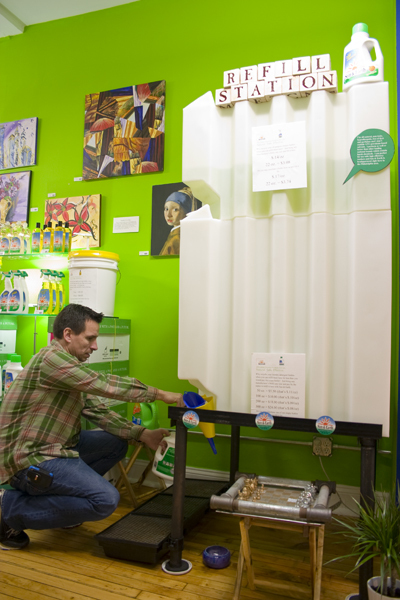 Well, down at the Big Green Earth Store on 2nd and Market, they have something almost as fun as a barrel of pickles: a refillable detergent station. Bring in your empty bottles of all purpose cleanser, or laundry or dish detergent, and you can refill them for less than the cost of a new bottle. No need to worry about the safety of the cleanser; it’s all non-toxic, and produced by Sun & Earth from King of Prussia. Tired of tossing stainless steel shaving cream cans into the trash? I was, so I went over to Whole Foods and discovered an old-fashioned bar of shaving soap by a company called Herban Cowboy. The shave is different, and a little rougher, but you’ll quickly grow accustomed to it, and before long the chemical fragrances from a can will seem alien. The company was started by a Pennsylvania couple, but they’ve since relocated to Minnesota. Boo! Any local soap makers have a competing product to offer?